2. To emphasize the eukaryotic nature of the fungi and its relationship to pathogenesis. 3. To establish familiarity with the scientific terminology peculiar to mycology. 4. To explore the nature of the pathogenesis of fungal infections. 5. To gain familiarity with the classification of medically-important fungi. 6. To develop an understanding of the nature and mode of action of anti-fungal agents. The fungi are more evolutionarily advanced forms of microorganisms, as compared to the prokaryotes (prions, viruses, bacteria). They are classified as eukaryotes, i.e., they have a diploid number of chromosomes and a nuclear membrane and have sterols in their plasma membrane. Genetic complexity allows morphologic complexity and thus these organisms have complex structural features that are used in speciation. Fungi can be divided into two basic morphological forms, yeasts and hyphae. Yeastsare unicellular fungi which reproduce asexually by blastoconidia formation (budding) or fission. Hyphaeare multi-cellular fungi which reproduce asexually and/or sexually. Dimorphism is the condition where by a fungus can exhibit either the yeast form or the hyphal form, depending on growth conditions. Very few fungi exhibit dimorphism. Most fungi occur in the hyphae form as branching, threadlike tubular filaments. These filamentous structures either lack cross walls (coenocytic) or have cross walls (septate) depending on the species. 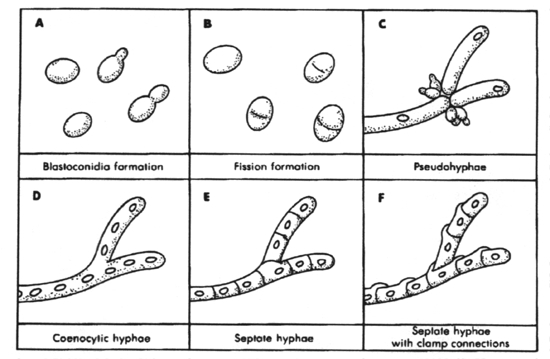 In some cases septate hyphae develop clamp connections at the septa which connect the hyphal elements. From Medical Microbiology, 1990, Murray, et al., p. 299, Fig. 28-1. Reproduced with permission. A mass of hyphal elements is termed the mycelium (synonymous with mold). Aerial hyphae often produce asexual reproduction propagules termed conidia(synonymous with spores). Relatively large and complex conidia are termed macroconidia while the smaller and more simple conidia are termed microconidia. When the conidia are enclosed in a sac (the sporangium), they are called endospores. The presence/absence of conidia and their size, shape and location are major features used in the laboratory to identify the species of fungus in clinical specimens. 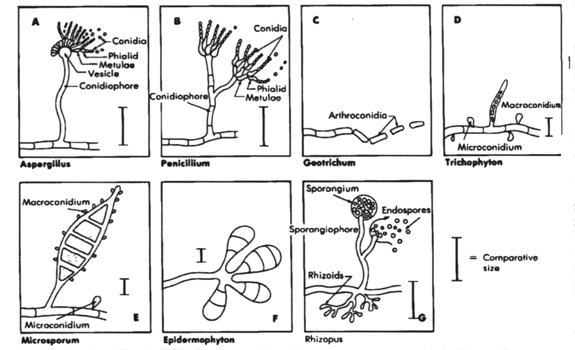 A. Aspergillus; B. Penicillium; C. Geotrichum; D. Trichophyton; E. Microsporum; F. Epidermophyton and G. Rhizopus. From Medical Microbiology, 1990, Murray, et al., p. 300, Fig. 28-2. Reproduced with permission. Asexual reproduction, via conidia formation, does not involve genetic recombination between two sexual types whereas sexual reproduction does involve genetic recombination between two sexual types. by humans or when they are fed to dairy cattle and they get into the milk supply, they affect humans. antimicrobial agents that are directed against the bacterial ribosome, e.g., chloramphenicol. When fungi do pass the resistance barriers of the human body and establish infections, the infections are classified according to the tissue levels initially colonized. B. Cutaneous mycoses - infections that extend deeper into the epidermis, as well as invasive hair and nail diseases. Sporotrichosis Sporothrix schenckii Nodules and ulcers along lymphatics at site of inoculation Budding yeast in tissue exudate that converts to mold with "rosette pattern" of conidiation on culture at 25oC. D. Systemic mycoses - infections that originate primarily in the lung and may spread to many organ systems. Dimorphic with mold to yeast transition when infecting susceptible species. Yeast cells are medium size with thick walls. Dimorphic with mold to yeast transition when infecting susceptible species. Yeast cells have multiple buds. Dimorphic with mold to spherule transition when infecting susceptible species. Spherules are multinucleate. Monomorphic with yeast phase only. This is the only pathogenic yeast with a capsule. The capsule is extremely large. 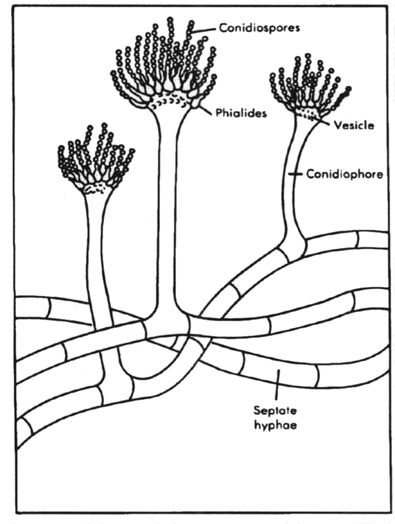 Asexual fruiting structure of Aspergillus species, illustrating septate hyphae, conidiophore, vesicle, phialides and conidiospores. 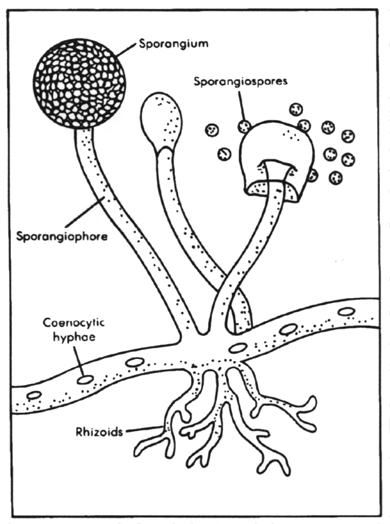 Asexual fruiting structure of Rhizopus species, illustrating sporangium, sporangiophore, sporangiospores, coenocytic hyphae and rhizoids. Amphotericin B - binds to ergosterol moiety in the plasma membrane causing derangement of the membrane integrity and leakage of cytoplasmic contents. Administered systemically. Nystatin - binds to ergosterol and disrupts plasma membrane. Highly insoluble and toxic and therefore used topically only. Block ergosterol synthesis at one or more sites with the accumulation of 14 -methyl sterol (which replaces ergosterol in the plasma membrane causing selective leakage and increased osmotic sensitivity). They also disrupt chitin synthesis. All effects are due to the binding to cytochrome P-450. 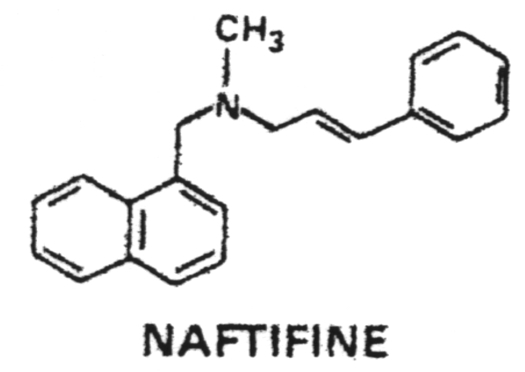 Naftifine - Binds to and inhibits squalene epoxidase which blocks ergosterol synthesis. 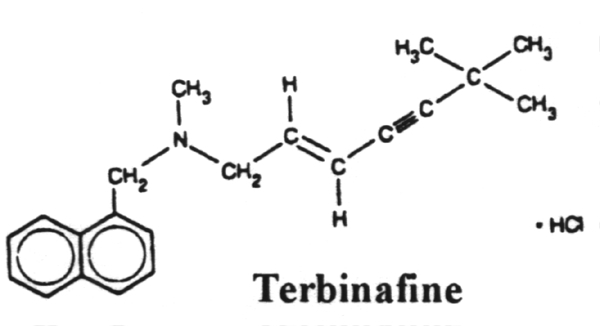 Terbinafine - Binds to and inhibits squalene epoxidase which blocks ergosterol synthesis. 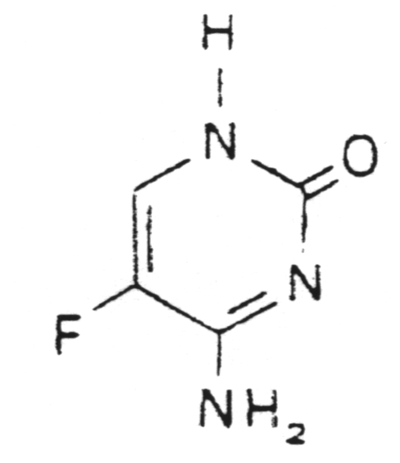 Flucytosine - It is deaminated to fluracil where it is either (1) incorporated into RNA in place of uracil where it inhibits protein synthesis or (2) metabolized to 5-fluorodeoxy-uridylic acid where it inhibits thymidylate synthetase, thus blocking DNA synthesis. 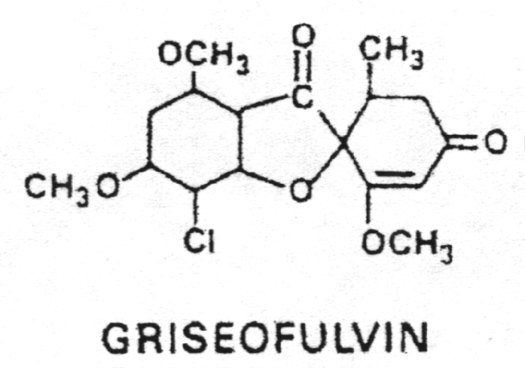 Griseofulvin - causes disruption of the mitotic spindle by interacting with polymerized microtubules through binding to microtubule protein. Administered systemically for dermatophytic infections. Haloprogin - a halogenated phenolic ether administered topically for dermatophytic infections. Ciclopirox olamine - a topical for the treatment of dermatophytic infections and Candida albicans. 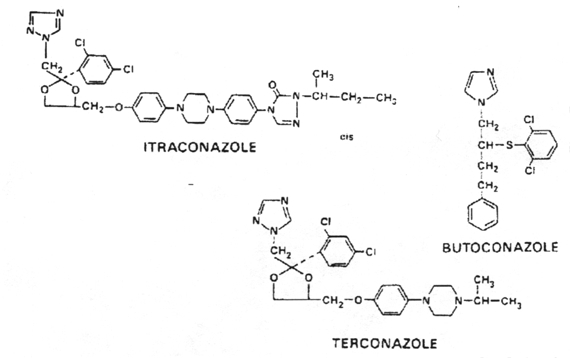 Tolnaftate - a thiocarbonate used to treat dermatophytic infections. 2. Hyphae are branching, threadlike, tubular filaments that either lack cross walls (coenocytic) or have cross walls (septate). 3. Hyphae reproduce asexually via the formation of spores termed microconidia or macroconidia. 4. Fungi produce toxins such as ergot alkaloids, psychotropic agents and aflatoxins. Grocott silver stain, hematoxylin or eosin. 6. India ink may be used as a negative stain to emphasize the capsule of yeast. cutaneous mycoses, subcutaneous mycoses and systemic mycoses. 9. The superficial mycoses include pityriasis versicolor, tinea nigra, black piedra and white piedra. 10. The cutaneous mycoses (tineas or ringworms) are restricted to growth in the keratinized layers of the skin, hair and nails. American blastomycosis, South American blastomycosis, coccidioidomycosis and fungal meningitis. 13. Fungi are most commonly cultured on Sabouraud's agar or Mycosel agar. 16. The polyene antifungals are amphotericin B and nystatin which bind to ergosterol in the plasma membrane, thus disrupting it. 18. The allylamines include naftifine and terbinafine which inhibit squalene epoxidase, thus blocking ergosterol synthesis. 20. The miscellaneous antifungals include griseofulvin, haloprogin, ciclopirox olamine, tolnaftate and potassium iodide. 21. The three genera of dermatophytes are Microsporum, Trichophyton and Epidermophyton.